anniversary of Macao’s return to the motherland in Macao, south China, on December 20, 2014.
government of the Macao Special Administrative Region (SAR) on Saturday morning. Chinese President Xi Jinping said here on Saturday of December 20 that nothing could shake the resolve to advance the practice of “one country, two systems,” a basic state policy of China. “No matter what difficulties or challenges we may encounter, they could never shake our confidence and resolve to uphold the principle and advance the practice of ‘one country, two systems,'” Xi said at a grand gathering marking the 15th anniversary of Macao’s return to the motherland. To continue to advance the cause of “one country, two systems” is the common mission of the central government, the governments of the Macao and Hong Kong special administrative regions (SAR), and people of all ethnic groups of the country, including compatriots in Hong Kong and Macao, he stressed. To firmly uphold the policy conforms with not only the fundamental interests of the country and the overall and long-term interests of Hong Kong and Macao, but also the interests of international investors, Xi told some 1,000 dignitaries including the SAR Chief Executive Chui Sai On and principal officials of the fourth-term government, who were just sworn in. Leung Chun-ying, chief executive of the Hong Kong SAR, was also present at the ceremony. The president urged unswerving commitment to the fundamental purpose of “one country, two systems” while jointly safeguarding national sovereignty, security and development interests, and maintaining long-term prosperity and stability of Hong Kong and Macao. “We must both adhere to the one-China principle and respect the differences of the two systems, both uphold the power of the Central Government and ensure a high degree of autonomy in the SARs, both give play to the role of the mainland as the staunch supporter of Hong Kong and Macao and increase their competitiveness,” he said. “At no time should we focus only on one side to the neglect of the other,” he said. Xi asked the SAR governments to govern Hong Kong and Macao and uphold the practice of “one country, two systems” according to law. The “one country, two systems” policy is vital to ensuring the long-term prosperity and stability of Hong Kong and Macao. It is also an important part of the endeavor to fulfill the Chinese dream of great national renewal, he said. “Never in history have we been closer to the goal of the great renewal of the Chinese nation, and never in history have we had greater confidence and capability to realize this goal,” he said. The president urged Chinese people, wherever they are, to contribute their share to this cause. “I am convinced that a more prosperous and stronger motherland will open up even brighter prospects for the development of Hong Kong and Macao,” he said. Chinese President Xi Jinping said here on Saturday of December 20 that Macao compatriots have gained a growing sense of identity and belonging with the motherland, 15 years after the region’s return to China. Xi told a celebration gathering that the close national bond of “blood being thicker than water” is becoming ever stronger. “Love for the motherland and love for Macao has become a prevalent value in Macao society,” he said. In the meantime, said the president, Macao, as a historical city where Chinese and Western cultures meet, displays a unique charm that belongs to a culture typical of Southern China, yet with a distinctive European touch. “Here, communities from various ethnic backgrounds live in harmony and help and learn from each other,” said Xi. Xi also pointed out that the Macao people have been making vigorous efforts to implement the principle of “one country, two systems” and have achieved fruitful results. 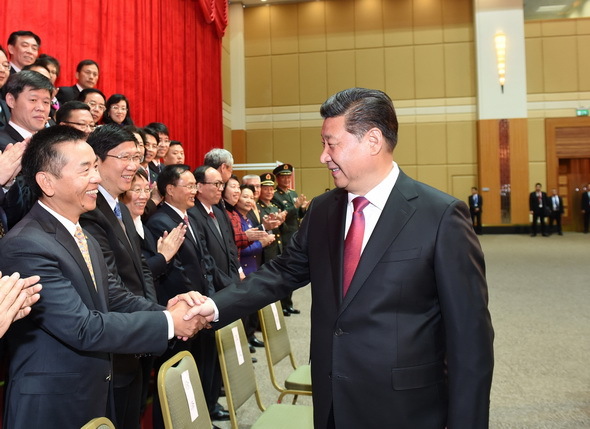 “Over the past 15 years, with the strong support of the central government and the mainland, and under the leadership of the chief executive and the government of the Special Administrative Region (SAR), people from various sectors in Macao have united as one,” said the president. Macao is having increasingly closer exchanges and cooperation with the mainland and continuing to make its unique contribution to the reform, opening-up and modernization drive of the motherland while sharing the opportunities and benefits brought by development of the mainland, the president noted. Xi said Macao has enjoyed orderly progress in democracy, fast economic growth, rising living standards, and social harmony and stability since its return to the motherland 15 years ago. “The constitutional order of the Macao SAR, as prescribed by the constitution and the Basic Law, is respected and upheld,” said the president. He said the central government’s overall governing power is effectively exercised while the high degree of autonomy enjoyed by the Macao SAR is fully guaranteed. Xi, hailing the remarkable achievements Macao has scored since its return, said it makes not only Macao residents but also people of all ethnic groups in China proud. “The valuable experience gained by Macao along the way should be cherished and remembered by Macao compatriots and people of all ethnic groups in the entire nation,” said the president. “The implementation of ‘one country, two systems’ will make steady and continuous progress along the right track and Macao will have a better future,” said Xi. President Xi Jinping on Saturday of December 20 urged appropriately diversified and sustainable economic development in Macao at a gathering marking the 15th anniversary of Macao’s return to China. Noting rapid economic and social progress, Xi said, “Certain deep-seated problems formed over the years have surfaced, and development risks have built up to some extent” in the region. “It is important for Macao to adopt a global, nationwide, future-oriented and long-term perspective, formulate appropriate plans and blueprints for its development and promote sound economic and social development,” he said in a speech delivered at the Macao East Asian Games Dome. The president stressed the necessity to make long-term planning, seize the opportunity of the national efforts to comprehensively deepen reform, and promote appropriately diversified and sustainable economic development in Macao based on its positioning as a global tourism and leisure hub and a service platform for economic and trade cooperation between China and Portuguese-speaking countries. On the one hand, Macao needs to solve difficult problems in its development, strengthen and improve regulation and supervision over the gaming industry and nurture new growth areas for its economy. On the other hand, it needs to make good use of the policies and measures put forward by the central government to support Macao’s development and deepen its cooperation with the mainland, particularly with Guangdong province and the Pan-Pearl River Delta region. “Macao needs to expand its development space and gain greater impetus for its development through regional cooperation and strive for common development and progress with the mainland,” Xi said. Xi arrived here on Friday and attended the inauguration of the fourth-term government of the Macao Special Administrative Region (SAR). Macao, home to 35 casinos, 5,716 gaming tables and 12,873 slot machines, has overtaken Las Vegas in terms of gaming revenue nearly a decade ago. The gaming industry contributed over 76 percent of the Macao SAR government’s revenues. However, its revenue fell for the sixth straight month in November after a decade-long rapid growth. To lessen the overwhelming dependence on gaming which is especially risky for a micro economy like Macao, the government vowed to “appropriately diversify” its economy by expanding its portfolio to develop tourism, including upscale shopping malls, resorts and convention centers, and traditional Chinese medicine. 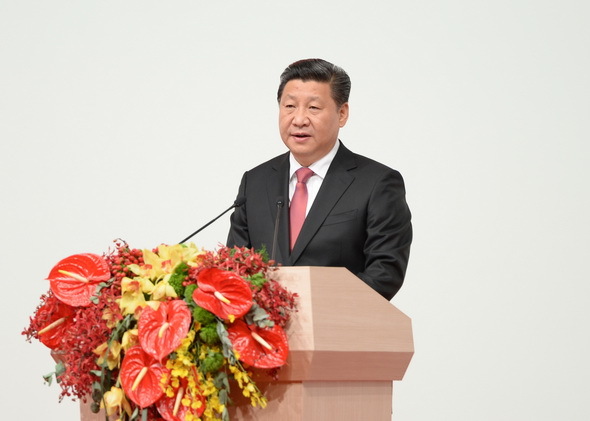 Chinese President Xi Jinping on Saturday of December 20 urged continued efforts to enhance social harmony and stability in the Macao Special Administrative Region (SAR). “Both the SAR government and people from all walks of life in Macao must doubly cherish and do everything they can to safeguard harmony and stability in Macao,” Xi said at a celebration gathering marking the 15th anniversary of Macao’s return to China. The president also urged the SAR government to “put people first,” properly respond to diverse demands in the society, balance the interests of various sides and foster a more equitable and just social environment. The SAR government needs to make sure that the Macao people have better access to the fruits of development, improve their quality of life and increase their happiness index, he said. Meanwhile, the president called on the Macao people to continue to love Macao and the motherland, support the work of the chief executive and the SAR government in governing Macao in accordance with law, strengthen social cohesion and positive energy, and work jointly for long-term prosperity and stability of Macao. Xi also emphasized the need to guard against external infiltration and interference, so as to maintain the sound atmosphere of stability and unity in Macao. To learn about local residents’ lives, Xi, shortly after arriving here Friday, paid a visit to a government-funded public housing estate, chatting with families in the neighborhood about their life and work. “The visit has opened a window for me to see the happy life enjoyed by people in Macao. It has also reflected Macao’s gratifying success in growing the economy, raising living standards and maintaining social stability,” he told guests at a welcoming dinner hosted by the SAR government Friday evening. Chui Sai On, the new-term chief executive of the Macao SAR, said that the SAR government will continue to intensify the establishment of long-term mechanisms for social security, health-care, housing, education and talent cultivation. The SAR government is also considering formulating long-term mechanism for allocation of fiscal surplus, so that social resources can be used more effectively, fairly and justly, workers can enjoy more dignity and upward mobility, said Chui. Macao’s gross domestic product (GDP) reached 413.47 billion patacas (51.76 billion U.S. dollars) in 2013, up from 50.27 billion patacas in 1999, with an average annual growth of 16.2 percent. The region’s GDP per capita jumped from 15,000 U.S. dollars in 1999 to 87,000 dollars in 2013, which ranks the second highest in Asia and the fourth in the world. Meanwhile, Macao’s unemployment rate dropped from 6.3 percent in 1999 to 1.7 percent in January 2014. The average monthly income tripled to 15,000 patacas from 4,920 patacas and the life expectancy of local citizens grew from 80.7 years in 1999 to 85 at present, the second longest in the world. Macao needs to solve difficult problems in its development, strengthen and improve regulation and supervision over the gaming industry and nurture new growth areas for its economy, according to Xi. The president arrived here on Friday and attended the inauguration of the fourth-term government of the Macao Special Administrative Region (SAR) on Saturday morning. With 35 casinos, 5,716 gaming tables and 12,873 slot machines, Macao has overtaken Las Vegas in terms of gaming revenue nearly a decade ago. A popular travel destination boasting the unique assimilation and co-existence of Chinese and Western cultures, Macao recorded some 29.3 million visitor arrivals in 2013. “The slower growth of the gambling industry has offered an opportunity to develop non-gambling elements,” said Leong Man Ion, deputy director of the Gaming Inspection & Coordination Bureau. Analysts pointed out that as one of the fastest-developing region in the world, Macao is embracing a “new normal” situation, featuring a transfer from high growth rate to a medium and steady growth stage, which will accelerate the strategic adjustment of its economic structure. Chinese President Xi Jinping on Saturday of December 20 called for vigorous efforts to enhance the ability and quality of law-based governance of the Macao Special Administrative Region (SAR). The evolving situation and people’s expectations have raised “new and higher demands for the governance of the SAR”, Xi said at a celebration gathering marking the 15th anniversary of Macao’s return to the motherland. Xi said particular attention should be paid to improving the institutions and legal systems designed to support the implementation of the Basic Law of the Macao SAR, so as to lay a solid institutional foundation for the governance of Macao in accordance with the law. 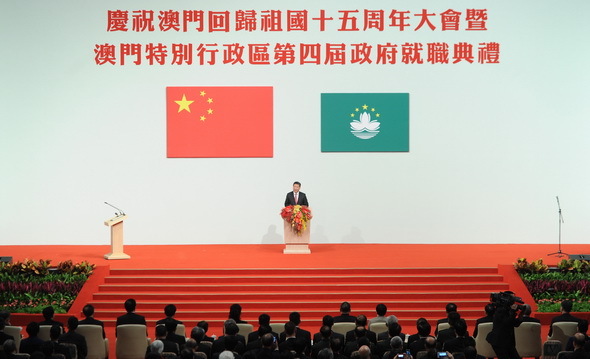 He affirmed that the Macao SAR has constantly improved its governance system and capability since its return to the motherland, noting that the constitutional order of the Macao SAR as prescribed by the Constitution and the Basic Law is respected and upheld. 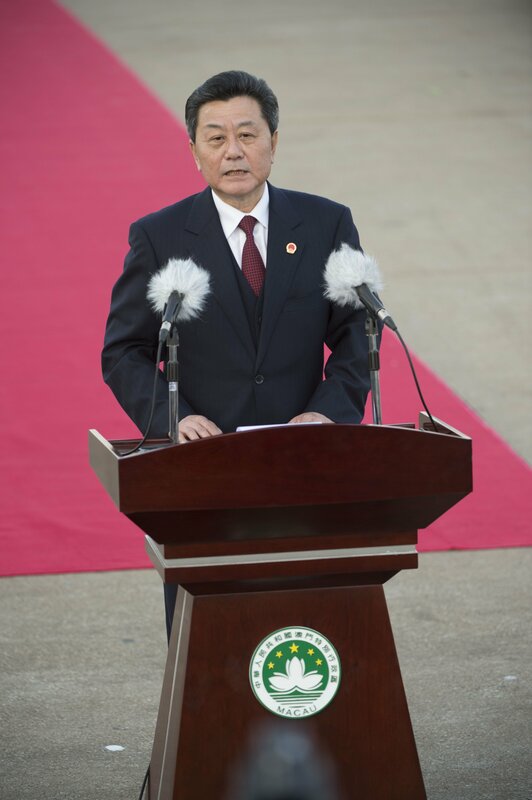 “We are glad to see that the principles of ‘one country, two systems’, ‘Macao people administering Macao’, and a high degree of autonomy as well as the Basic Law of the Macao SAR have won massive support from the people in Macao and have been implemented in real earnest,” he said. The president called for efforts to make good use of law-based thinking and approach in governance and the need to increase public awareness of the rule of law. “The course of human progress shows that law-based governance is the most reliable and stable way of governance,” he said. Xi also underlined the importance of providing a strong backing of human resources for the law-based governance in Macao, saying it is necessary to build a diligent, clean, efficient and fair government under the rule of law. Efforts should be made to improve the public officials’ duty-performing abilities and train a large number of professionals who are familiar with the Basic Law and possess strong legal expertise, he added. Xi’s remarks came at a time when China is working toward building a country governed by the rule of law. Chui Sai On, the new-term chief executive of the Macao SAR, pledged after he was sworn in Saturday morning that the SAR government will put more efforts in perfecting the government official accountability system and promoting legal system development and anti-corruption. The new-term SAR government is committed to “fully, comprehensively and correctly understanding and implementing the Basic Law,” Chui said. Chinese President Xi Jinping on Saturday of December 20 met with principal officials of the fourth-term government and heads of legislative and judicial organs of the Macao Special Administrative Region (SAR). 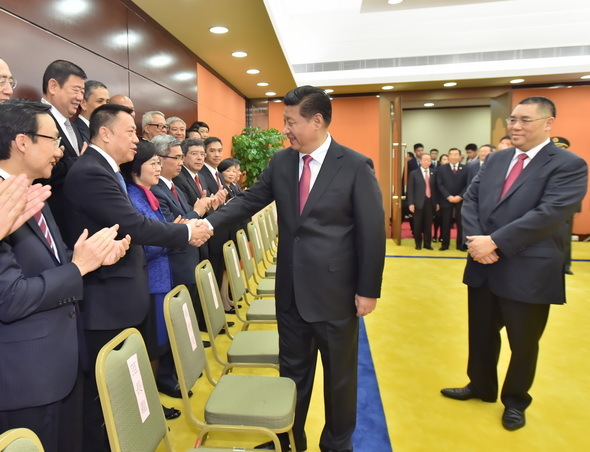 The meeting was held after Xi attended a grand gathering to mark the 15th anniversary of Macao’s return to China and a swearing-in ceremony of the fourth-term government of the Macao SAR. The new SAR government faces high expecations from the entire society, Xi said, urging them to ensure a smooth transition of work. Xi also called on the officials to perform their duties strictly under the Basic Law, defend the authority of the chief executive, and ensure the smooth operation of the regions’ administrative, legislative and judicial bodies. The president encouraged the officials to address top concerns of the Macao people and be brave to crack the hard nut in the development progress of the SAR. Xi said he believed that with the support of the central government, the strong leadership of the chief executive and the hard work of the new government, Macao will open a new chapter of prosperity and stability. of Macao’s return to the motherland, in Macao, south China, on December 20, 2014. Xi met with the officials and senior executives after attending the celebration marking the 15th anniversary of Macao’s return to the motherland and the inauguration of the fourth-term government of the Macao Special Administrative Region (SAR). Since Macao’s return, the central government offices stationed in the SAR and the Macao branches of mainland enterprises and institutions have made significant contribution to local prosperity and stability, as well as the implementation of the “one country, two systems” policy and the SAR’s Basic Law, said Xi. The president urged them to keep working with firm belief to further boost the unity of the people from all walks of life in Macao. They should have greater sense of responsibility and enhance working capability to push forward the practice of “one country, two systems” in Macao, on the basis of thorough understanding of the central government’s policies on Hong Kong and Macao. Special Administrative Region (SAR) in Macao, south China, on December 20, 2014. Chinese President Xi Jinping on Saturday of December 20 urged soldiers of the Chinese People’s Liberation Army (PLA)’s Macao Garrison to unswervingly uphold the principle of “one country, two systems” and safeguard the region’s prosperity and stability. Xi, also general secretary of the Central Committee of the Communist Party of China and chairman of the Central Military Commission, also required the soldiers to perform defense duties in accordance with the Basic Law and the Garrison Law of the Macao Special Administrative Region (SAR). Xi, who arrived here Friday to attend celebrations marking the 15th anniversary of Macao’s return to China and the inauguration of the SAR’s fourth-term government, made the remarks during an inspection to the PLA Macao Garrison on the Taipa Island. 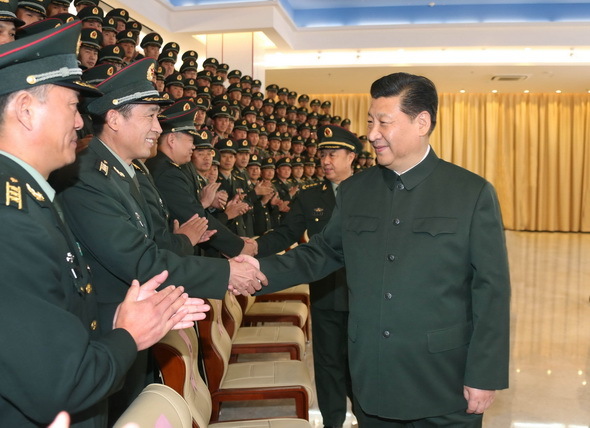 Xi praised the troops’ resolute implementation of the orders of the Central Military Commission, their continued efforts for self-improvement and faithful performing of obligations. The garrison, responsible of Macao’s defense since in 1999, has portrayed a good image of the PLA and won widespread acclaim from local people for its major contribution to Macao’s prosperity and stability, Xi noted. Xi emphasized the significant role and glorious mission of the PLA Macao Garrison’s as a symbol of China’s national sovereignty, and urged the soldiers to further enhance training and management. The president also called on them to love Macao and the motherland and make selfless devotions for the benefit of the Macao people. University of Macao’s new campus on Hengqin island, on December 20, 2014.
his visit to the University’s new campus on Hengqin island, on December 20, 2014.
xPresident Xi Jinping on Saturday of December 20 stressed the importance to strengthen the future-oriented education and upbringing of the young people in Macao, which was striving to address the shortage of human resources. “Young people in Macao represent not only the hope and future of Macao, but also the hope and future of the whole country,” Xi said at a gathering marking the 15th anniversary of Macao’s return to China. “We need to strengthen the education and upbringing of young people to ensure that fine tradition of loving the motherland and loving Macao will be carried forward from one generation to another and that the cause of ‘one country, two systems’ will be continuously advanced,” he said. The president said the fine traditional culture that the Chinese nation has created and carried forward in its thousands of years of history is the root and and soul of the Chinese nation. “In the education of the young people, priority should be given to the history, culture and national condition of China,” so that they will better appreciate the richness of the Chinese civilization, the glorious journey of the Chinese nation since modern times, the endeavor and achievement of new China, and the intrinsic link between sticking to the principle of “one country, two systems” and upholding and developing socialism with Chinese characteristics and realizing the Chinese dream of great national renewal, he said. In this way, the young people will fully understand the destiny and future of Macao are closely tied to those of the motherland, thus having a stronger sense of national pride and deeper love for the motherland and Macao. Xi, who arrived here on Friday, attended the anniversary celebrations and the inauguration of the fourth-term government of the Macao Special Administrative Region (SAR). The SAR government has been working to enhance the understanding of the Basic Law of Macao, a constitutional document, among the local residents. Introducing the Basic Law is part of a citizenship course at Macao shools. Meanwhile, in order to address the shortage of human resources, which together with the limited land were two major challenges facing Macao, the SAR governemnt has been launching talent cultivation initiatives. A talents development committee, chaired by Chief Executive Chui, was also established earlier this year to look for ways to increase the number of people undertaking tertiary education and fill gaps in the labor market. Macao introduced a 15-year compulsory education scheme in 2007, which is among the few in the world that provide free-education from kindergarten to senior high school. President Xi Jinping on Saturday of December 20 encouraged Macao youth to absorb quintessence from traditional Chinese culture and constantly refine personal cultivation and knowledge to better contribute to society. 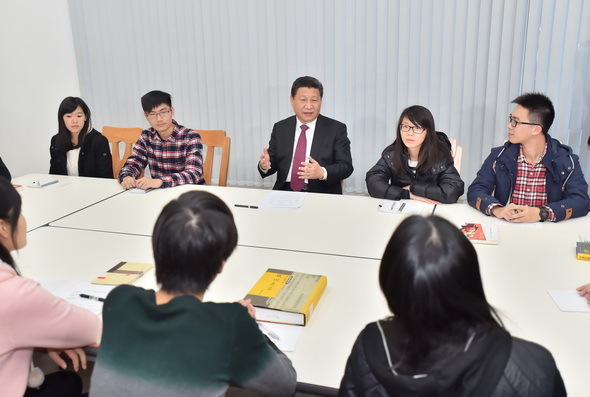 Despite tight schedule in a two-day visit to Macao, Xi spent a lighthearted moment on Saturday afternoon with a group of students at the University of Macao’s Hengqin campus, exchanging thoughts about reading. “When I was young, I liked very much to read traditional Chinese classic works, and kept learning knowledge bit by bit,” he told the students from Macao, the mainland and Taiwan, who were attending a discussion on traditional culture and youth. “Chinese culture has a long history and extensive knowledge, just like a treasure house which can benefit you for lifetime as long as you explore it,” he said. “Even now I still like to pick up a book to read if I had a free moment. It’s always beneficial,” he said. He encouraged the young people to absorb quintessence from the traditional culture while discarding the dross to nurture spiritual pursuit and guidelines of action. The students told the president their ideas about how to carry forward traditional virtue of the Chinese nation and how to be a good person. Young people should enhance a sense of national pride, moral integrity and confidence in Chinese culture through learning the history of the Chinese nation, Xi said. 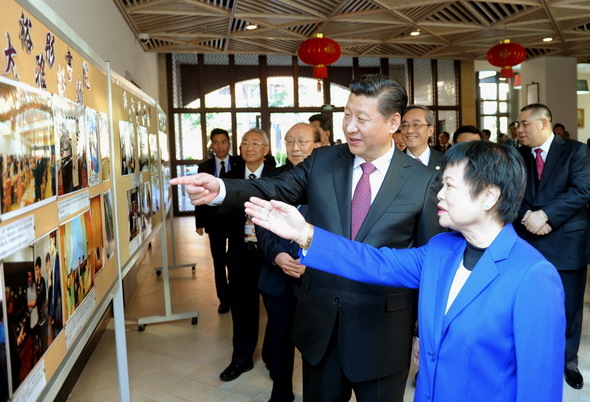 Accompanied by the Macao Special Administrative Region’s chief executive Chui Sai On, Xi inspected the university’s brand new campus on Hengqin Island, which was constructed in accordance with a decision announced by the Central Government five years ago. The campus with a capacity to accommodate more than 10,000 students is 20 times bigger than the old one, equipped with state-of-the-art teaching and research facilities. After learning that the university had achieved major progresses in the research of nano chips and traditional Chinese medicine, Xi said he hopes the university will make new breakthroughs for the country’s innovation-based development. During the interaction with the students, Xi also urged the students to enhance their sense of responsibility for the country and the SAR, while making enough preparations in knowledge, vision and capability for future professional career. 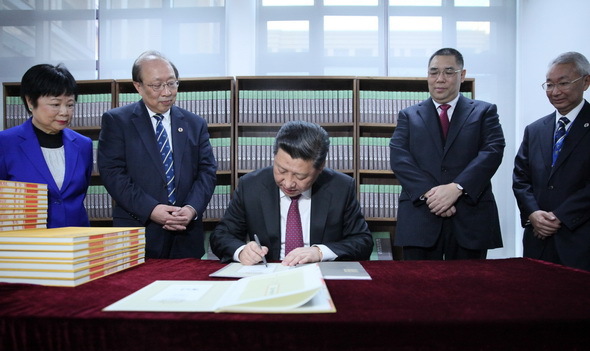 Before ending the visit, Xi presented the university a copy of the Yongle Canon, the world’s earliest and biggest encyclopedia compiled in the early 1400s, and a collection of rare Chinese local records kept at Peking University Library. Also on Saturday, Xi’s wife Peng Liyuan, accompanied by Chief Executive Chui’s wife Fok Wai Fun, visited the Family House of Zheng Guanying, a late-Qing Dynasty (1644-1911) philosopher and writer who completed his acclaimed masterpiece Words of Warning in Times of Prosperity in the complex. The buildings feature a blend of characteristics of Chinese and Western architecture, which represents the unique cultural attraction in Macao. Peng also appreciated the performance of the Cantonese Naamyam, a narrative folk singing popular in the Pearl River Delta region, which was inscribed on the National List of Intangible Cultural Heritage in 2011. Chinese President Xi Jinping visited the new campus of the University of Macao (UM) on Hengqin island on Saturday of December 20. Hengqin is situated in the south of Zhuhai, a coastal city of south China’s Guangdong Province. It is separated from Macao by the Pearl River Estuary. In June 2009, the Standing Committee of the National People’s Congress passed a decision, authorizing the Macao Special Administrative Region jurisdiction over 1.09 square km of land located on the eastern coast of the island, where UM’s new campus is located. A prestigious public school in Macao, the UM’s old campus occupied a hilly strip of no more than 0.05 square km with just over 6,600 students due to limited land. The new campus, inaugurated in 2013, is able to accommodate 10,000 students with state-of-the-art teaching and research facilities, including the State Key Laboratory of Analog and Mixed-Signal Very Large Scale Integration and the State Key Laboratory of Quality Research in Chinese Medicine. An undersea tunnel was built to enable 24-hour traffic between the campus and Macao. Faculty staff, students, and visitors are able to access the campus through the tunnel without going through any border control. Chinese President Xi Jinping on Saturday of December 20 delivered a speech at a gathering marking the 15th anniversary of Macao’s return to China and the inauguration of the fourth-term government of the Hong Kong Special Administrative Region. This occasion reminds us of what happened 15 years ago today. On that day, the Chinese government resumed the exercise of sovereignty over Macao,and the Macao SAR of the People’s Republic of China was established. Macao returned to the embrace of the motherland and embarked on a promising path of mutual complementarity and common development with the mainland. That was an event of great historic significance in the development of the Chinese nation and marked a new chapter in Macao’s development. ♦ We are glad to see that the principles of “one country, two systems”, “Macao people administering Macao”, and a high degree of autonomy as well as the Basic Law of the Macao SAR have won massive support from the people in Macao and have been implemented in real earnest. The constitutional order of the Macao SAR as prescribed by the Constitution and the Basic Law is respected and upheld. The Central Government’s overall governing power is effectively exercised while the high degree autonomy enjoyed by the SAR is fully guaranteed. Our compatriots in Macao are masters of their own house entitled to broad freedoms and democratic rights in accordance with law. Macao enjoys orderly progress in democracy, fast economic growth, rising living standards, and social harmony and stability. All-round progress has been made in its various undertakings, and its exchanges with the outside have continued to expand. ♦ We are glad to see that Macao is having increasingly closer exchanges and cooperation with the mainland and continuing to make its unique contribution to the reform, opening-up and modernization drive of the motherland while sharing the opportunities and benefits brought by development of the motherland. Macao compatriots have gained a growing sense of identity and belonging with the motherland. The close national bond of “blood being thicker than water” is becoming ever stronger. Love for the motherland and love for Macao has become a prevalent value in Macao society. ♦ We are glad to see that as a historical city where Chinese and Western cultures meet, Macao displays a unique charm that belongs to a culture typical of Southern China, yet with a distinctive European touch. Here, communities from various ethnic backgrounds live in harmony and help and learn from each other. Together, they present to the world a dynamic Macao beaming with vitality. “One country, two systems” is a basic state policy. To firmly uphold this policy is vital to ensuring the long-term prosperity and stability of Hong Kong and Macao. It is also an important part of our endeavor to fulfill the Chinese dream of great national renewal. It conforms with the fundamental interests of the country and the nation, the overall and long-term interests of Hong Kong and Macao, and the interests of international investors. To continue to advance the cause of “one country, two systems”, we must stay committed to the fundamental purpose of “one country, two systems”, jointly safeguard national sovereignty, security and development interests, and maintain long-term prosperity and stability of Hong Kong and Macao. We must continue to govern Hong Kong and Macao and uphold the practice of “one country, two systems” according to law. We must both adhere to the one-China principle and respect the differences of the two systems, both uphold the power of the Central Government and ensure a high degree of autonomy in the SARs, both give play to the role of the mainland as the staunch supporter of Hong Kong and Macao and increase their competitiveness. At no time should we focus only on one side to the neglect of the other. This is the only way leading to sound and steady progress. Otherwise, a misguided approach from the beginning, just like putting one’s left foot into the right shoe, would lead us to nowhere. To continue to advance the cause of “one country, two systems” is the common mission of the Central Government, the SAR governments and people of all ethnic groups of the country, including compatriots in Hong Kong and Macao. No matter what difficulties or challenges we may encounter, they could never shake our confidence and resolve to uphold the principle and advance the practice of “one country, two systems”. Our motherland is at a crucial stage to complete the building of a society of initial prosperity in all respects, comprehensively deepen reform, and fully promote the rule of law. Under the leadership of the Communist Party of China (CPC), people of all ethnic groups in China are making concerted efforts to realize the two “centenary goals” (to complete the building of a society of initial prosperity in all respects when the CPC celebrates its centenary in 2021 and turn China into a modern socialist country that is prosperous, strong, democratic, culturally advanced and harmonious when New China marks its centennial in 2049) and the Chinese dream of the great renewal of the Chinese nation. Our motherland has experienced and is experiencing unprecedented, profound changes in various fields. We have substantially enhanced China’s aggregate national strength, people’s wellbeing, international standing and influence. Never in history have we been closer to the goal of the great renewal of the Chinese nation, and never in history have we had greater confidence and capability to realize this goal. Today, every Chinese can travel around the world with greater confidence and pride, because standing behind us is a great and strong country with over 9.6 million square kilometers of land and over 1.3 billion people, a place all the sons and daughters of the Chinese nation call their motherland. To realize the Chinese dream of the great renewal of the Chinese nation is the call of the times and the mission of the nation. Chinese people living in our age, wherever they are, have every reason to be proud of it and contribute their share to this cause. I am convinced that a more prosperous and stronger motherland will open up even brighter prospects of the development of Hong Kong and Macao. As a line of Chinese poem reads, “The green lotus leaves stretch to the horizon and the lotus flowers look incredibly red in the sunshine.” With the joint efforts of the Central Government, the SAR government and people from across sectors in Macao and with the vigorous support of people of all ethnic groups of the country, the practice of “one country, two systems” will have even greater success in Macao, and Macao, the beautiful lotus flower of the motherland, will blossom with even more splendid color. of the fourth-term government of the Macao Special Administrative Region. Chinese President Xi Jinping wrapped up his visit to Macao Saturday afternoon of December 20 after attending celebrations for the 15th anniversary of Macao’s return to China and inaugurating its fourth-term government, among other activities on his tight itinerary. The president hailed the successful implementation in Macao of the principle of “one country, two systems,” a basic state policy vital to ensuring the long-term prosperity and stability of Hong Kong and Macao, as well as the progress Macao has made since its return 15 years ago. Addressing the anniversary ceremony, Xi also administered the swearing-in of Chui Sai On as the fourth-term chief executive and the new government of the Macao Special Administrative Region (SAR). The president called on the Macao people to keep making contribution to the reform, opening-up and modernization drive of China while sharing the opportunities and benefits brought by China’s development. “I am convinced that a more prosperous and stronger motherland will open up even brighter prospects of the development of Hong Kong and Macao,” he said. Chui, 57, vowed in his inaugural address that he would fully and correctly implement the “one country, two systems” policy and spare no effort for an appropriate diversification of Macao’s economy. 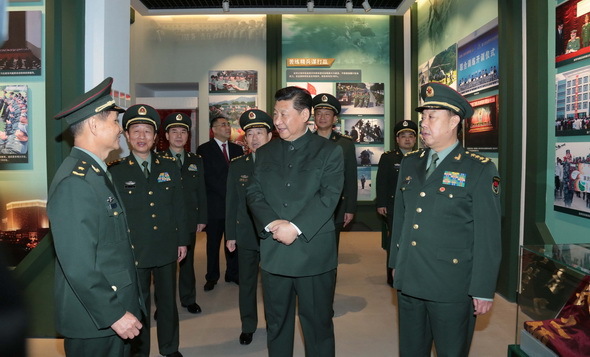 Xi, also general secretary of the Central Committee of the Communist Party of China and chairman of the Central Military Commission, inspected the Chinese People’s Liberation Army’s Macao Garrison on Saturday, the second day of his Macao trip. He urged the soldiers to unswervingly uphold the principle of “one country, two systems,” safeguard Macao’s prosperity and stability, and make selfless devotions for the benefit of the Macao people. On the Hengqin Island campus of the University of Macao in the afternoon, Xi joined the students from Macao, the mainland and Taiwan in their discussion, encouraging the youth to absorb quintessence from traditional Chinese culture and constantly refine personal cultivation and knowledge to better contribute to society. During his stay in Macao Friday, the president also visited two low-income families in the region’s largest public housing estate, in a bid to learn more about the local residents’ daily life. Li Gang, director of the Liaison Office of the Chinese central government in Macao, spoke highly of Xi’s two-day visit, saying it gives a clear guidance for the region’s future development. President Xi’s remarks on the “one country, two systems” principle and expectations for the local community to support the SAR government’s law-based governance are of great significance to maintaining long-term prosperity and stability of the region, Li said. Chinese President Xi Jinping’s 28-hour visit to Macao has given a clear guidance to the future development of the region, a senior official of the Liaison Office of the central government said here on Saturday of December 20. 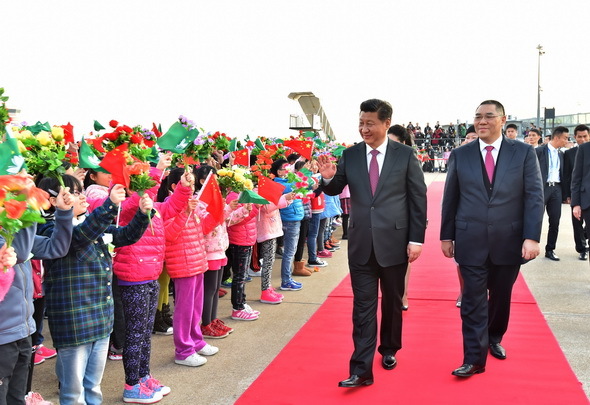 President Xi arrived here Friday noon, and during his stay, he attended the celebrations marking the 15th anniversary of Macao’s return to the motherland and the inauguration of the fourth-term government of the Macao Special Administrative Region (SAR). The president also paid visits to a university campus and a public housing neighborhood, chatting with students and residents, and inspected the Macao Garrison of the People’s Liberation Army. 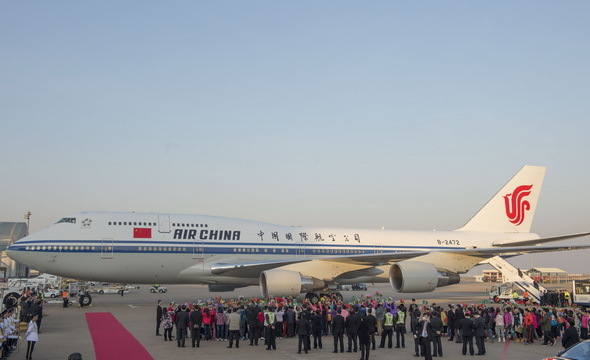 “The president’s successful visit to the region has impressed the Macao compatriots deeply,” Li Gang, director of the Liaison Office, told the press at the Macao International Airport where Xi left Saturday afternoon. President Xi, in a series of important remarks, affirmed the successful practice of the “one country, two systems” principle and pointed out the prominent problems in Macao’s economic and social development, which Li believed will give a major impetus to the future development of the region. The president’s remarks on the “one country, two systems” principle and expectations for the local community to support the SAR government’s law-based governance are of great significance to maintaining long-term prosperity and stability of the region, Li said. President Xi also showed great concern over the well-being of the Macao people, Li said, referring to Xi’s visit to the families of low-income workers, during which Xi expressed hope that the SAR government will pay more attention to improving the people’s livelihood so that the people could have a better access to the fruits of the region’s development. During a discussion with students of the University of Macao, the president hoped they will study hard so as to make contribution to the future of the country and Macao as well. “The president’s sincere remarks will encourage the students to work diligently, becoming talents with strong expertise in the future,” Li said. World experts have spoken positively about Macao’s impressive achievements after its return to the motherland and the important role that the principle of “one country, two systems” has played in the city’s development. As Saturday marks the 15th anniversary of Macao’s return to China, the world once again focuses its attention on the region, amazed by its incredible achievements in the last 15 years. In an exclusive interview with Wu Wuhua, president of the Chaozhou Guild in France, said the success of the “one country, two systems” principle in Macao has set an example for Hong Kong. Wu first congratulated Macao for the 15th anniversary of its return to the motherland, saying the government of the Macao Special Administrative Region (SAR) and the people of Macao have conducted various activities within the framework of such principles. Xulio Rios, director of Spain’s website of the Observatory of Chinese Politics, said that Macao has experienced great economic success over the past 15 years. Since China resumed the exercise of sovereignty over Macao in 1999, the region’s economy has grown by over 550 percent, with current unemployment rate at a low of 1.7 percent. This year Macao is expected to beat Switzerland in terms of GDP per capita, ranking fourth in the world, he added. The indices of public confidence in the authorities indicate the government’s high popularity above 50 percent and even 60 percent, with majority of local residents in favor of the region’s autonomy under the principle of “one country, two systems”, said Rios. “A few years later…a Portuguese official told me that he was impressed by the strategic vision that Chinese negotiators had shown. And this strategic vision has been demonstrated in practice in recent years,” he said. In the 15 years governed by the SAR government, Macao has undergone major changes as a result of economic development and has also continued to maintain its characteristics and unique social balance. Its per capita income has increased from 15,000 U.S. dollars to 87,000 dollars, taking an extraordinary lead in Asia, said Soto. Meanwhile, Macao is diversifying its productive activity and tries to depend less on casinos, while the gambling industry has dropped in the past year and other sectors can be supported by monetary reserves of the government of Macao, which will facilitate social stability, he noted. Foreign observers agree that the development formula of “one country, two systems” has worked efficiently in this former Portuguese colony over the past 15 years. It has maintained harmony in such a varied and dynamic society and kept it open to the rest of the world, he said. Alessandra Lavagnino, a sinologist and professor of Chinese language and culture at the University of Milan, told Xinhua in a recent interview that “from a dozy city, Macao has transformed into an international metropolis”. “China’s ‘one country, two systems’ policy has generated more wealth for everybody and allowed the city to tap its potentials,” she added. Romeo Orlandi, vice president of the Bologna-based think-tank Osservatorio Asia, said he has recently visited Macao and was impressed by the positive results produced by the “one country, two systems” policy. The Macao SAR has left behind the image of a city “laid down on the past” to “enter globalization with full rights through China,” Orlandi noted. Macao has established with the motherland a “win-win” relationship from which both have benefited, he added. The local government has set the conditions for a “significant improvement of social protection and the education system in the region,” said De Giorgi. Qian Feng, vice director of the Chinese-language newspaper Asian Daily in Thailand, said that the practice of “one country, two systems” has proved to be a very wise one, as it has not only guaranteed smooth transition in the process of Macao’s return to the motherland, but also demonstrated the inclusiveness and diversity of the Chinese culture. Over the past 15 years, the central government has adhered to the policy of “one country, two systems”, with no interference in Macao’s economic development and political system, which has enabled it to maintain a rapid economic growth, he added. “In the meantime, the prosperity of the Chinese mainland has created great many opportunities for Macao, with the mainland consistently playing a supportive role,” Qian said.